Yangon, Oct 17 : Three detained journalists appeared in a Myanmar court on Wednesday to face charges filed against them by the Yangon city government, which alleges a story they published was false. An increasing number of journalists have been arrested and jailed for their work under Myanmar’s civilian government, led by Nobel Peace Prize laureate Aung San Suu Kyi, a former political prisoner. 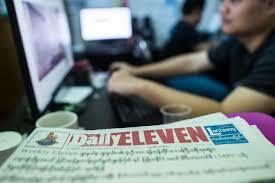 A director in the Yangon city government filed a complaint saying the journalists — editor in chief Kyaw Zaw Lin, managing editor Nari Min and chief reporter Phyo Wai Win — violated a law banning publication of “incorrect information” that could cause “fear or alarm to the public.” Punishment under the law can include two years’ imprisonment and a fine. Recent jailings of journalists in Myanmar include Reuters reporters Wa Lone and Kyaw Soe Oo, who were sentenced to seven years in prison earlier this year. They had been reporting on the military’s operations against minority Rohingya Muslims and were accused of possessing secret documents.